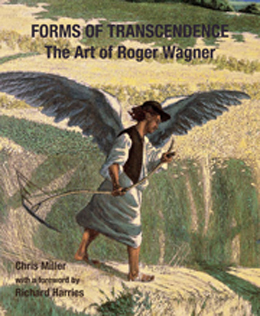 Forms of Transcendence: The Art of Roger Wagner, text by Chris Miller, foreword by Richard Harries, Piquant Editions, 2009. With these two works Piquant Editions has now published its third and fourth books in the VISIBILIA series. This publisher is known to many for its outstanding contribution in providing resources on the subject of art and Christian faith. The works of Calvin Seerveld and those of Hans Rookmaaker are among its publications. VISIBILIA is a recent series that is aimed to provide introductions to the work of outstanding Christian artists. Print maker Peter Smith of London England was featured in the first book in this series and Canadian painter Maria Gabankova in the second. Chris Miller has provided illuminating and insightful commentary on Wagner’s work. This British artist has produced powerful work which brings together biblical story and contemporary life. The images are striking in their colour and subject matter. One example is the painting, Surely He Has Borne our Griefs, “three bare crosses stand in front of the Didcot power station, whose two sets of three cooling towers and singe central chimney together make up a Menorah”. The second book profiles the photographs of Wheaton College art historian John Walford. This richly illustrated work traces the author’s artistic journey bringing together photographs and images of paintings from past and present. Both of these books are a pleasure to look at and to read.